The Dahlgren Heritage Museum is proud to be a model for future military museums, which will depend more than ever on strong community support. Under this model, it is the responsibility of the private foundation to raise the funds to open and operate the museum. 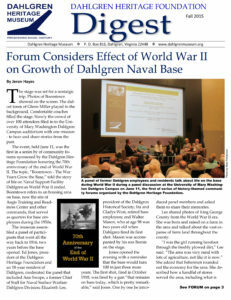 Though by law no direct financial support can come from the Navy nor can the Navy endorse the museum’s own fundraising efforts, nor are we an official U.S. Navy museum, we are proud of our strong working relationships with the military commands at Dahlgren and with the Naval History and Heritage Command in Washington.